The real odds of this Saturday afternoon accumulator tip are just 2/1, but if you open a new Ladbrokes account to bet on the selections, you’ll get paid out at a whopping 70/1 for the same bet. It all kicks off at 12.30pm with Tottenham against Huddersfield and we need a Spurs win to get the accumulator rolling. The next two selections are from the Championship and we need Derby to beat Bolton and Sheffield United to win at home against Millwall, as they look to get back into the automatic promotion places following Leeds’ win in midweek. The final selection for the accumulator this week is Manchester United to win in the 5.30pm kick-off against West Ham United. The match is at Old Trafford and it should be an easy win for the home side, despite having one eye on the Champions League return leg with Barcelona coming up next week. 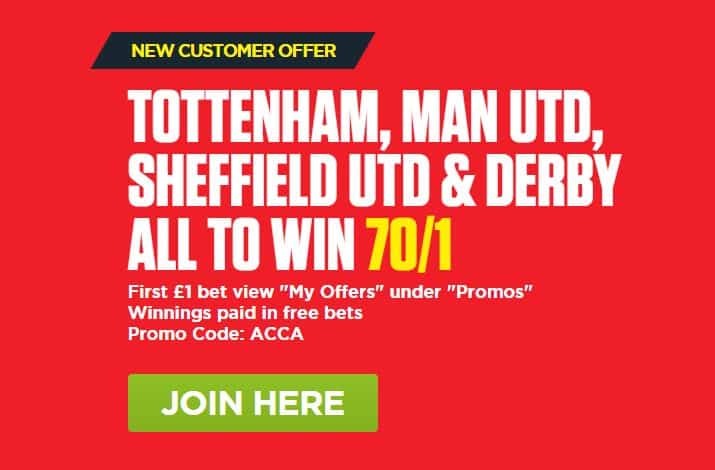 BET NOW – 70/1 for Spurs, Derby, Sheffield United and Man Utd all to win. 18+ Eligible UK+IRE players. Min deposit £5. Paypal and some deposit types excl. Winning bets paid in cash as normal price. Enhanced odds paid in £5 free bets within 24 hours, valid for 4 days, stake not returned, restrictions apply. T&Cs apply. You need to be a new Ladbrokes customer to qualify for this bet and you must use this special link otherwise you won’t activate the offer on your account. Once you have filled in your details you will see the 70/1 accumulator under the Promos > My Offers section. From there you can place the bet.